I've read/watched/listened to several items over the last few weeks that are trying to coalesce into a common theme. I'm not sure I quite have what that theme is yet, but I'm going to share anyway. Quote 1: Our technology is different, our car is different, and, as a result, our stores are intentionally different. Quote 2: Automotive franchise laws were put in place decades ago to prevent a manufacturer from unfairly opening stores in direct competition with an existing franchise dealer that had already invested time, money and effort to open and promote their business. Quote 3: At Tesla, we will continue to focus on the future and the future of your children, grandchildren and their children. Questions: Should our schools be intentionally different? Can an existing school transform in such a way? Can we focus that far in the future, or does the institutional imperative to preserve itself override any possibility of that? 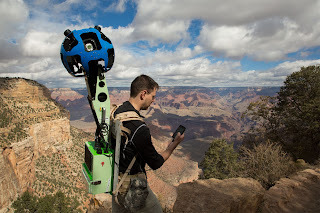 Quote 1: Earlier this week, two teams from Google strapped on sophisticated backpacks jammed with cameras, gyroscopes and other gadgets, and descended to the bottom of the Grand Canyon. But this is just the first step in the search giant's plan to digitally map and photograph the world's wild places. Quote 2: This is just the beginning. Google wants to send the Trekker on expeditions all over the world. Team members talk about everything from the Appalachian Trail to Antarctica — and one day maybe even Everest. Questions: Holodeck, anyone? Combine this with Siri, Google Glass, Wolfram Alpha, etc. - do we just need to rethink everything about school? About learning? Quote 1: Yet, all of the new monkeys vigorously enforce the prohibition against trying to get the banana because, hey, that’s how we do things around here. Quote 3: In these schools, whenever an enterprising teacher did something new and excellent that also was perceived to be too far beyond the norm, the other teachers would engage in behaviors that were intended to hold her back and instead re-align her to what everyone else was doing (or not doing). Quote 4: The challenge for us, however, is that we live in a time of significant disruption. As new information environments, economic realities, and learning landscapes form themselves before our very eyes, transitioning our school systems so that they are relevant for today and tomorrow, not just yesterday, is going to require gobs of innovation and experimentation. Yet we have schooling, policy, and leadership cultures that are extremely intolerant of risk-taking and, indeed, will vigorously intervene to reinforce static processes, mindsets, and behaviors. Questions: Sometimes I need to be the flea, but jump when the lid is off. Sometimes I need to be the jar (without the lid), providing constraints and guidance to help my students jump (and achieve "escape velocity" and leave the jar (me) behind). Is school the lid? Is curriculum the lid? Or am I the lid? Quote 1: As new hires come on board, the new hires automatically follow this example. Questions: Can the change really come from within? Does the institutional education jar, almost by definition, have to come with a lid? Is the flea jar a perfect metaphor for Race to the Top? Quote 1: They're trying to meet the future by doing what they did in the past. Quote 2: An aesthetic experience is one in which your senses are operating at their peak. When you're present in the current moment. When you're resonating with the excitement with this thing you're are experiencing. When you are fully alive. An anesthetic is when you shut yourself off. Questions: It's said that those who forget the past are condemned to repeat it. But is it possible that school, by its very nature, is so focused on the past that it's condemned to ignore the present and the future? Is "backwards planning" a stunningly apropos description? Are we figuratively (and sometimes literally) drugging our children so that they don't notice this fact? Are we drugging ourselves? Like I said, not quite sure I've figured out how this all fits together for me yet. Maybe it doesn't. Or maybe it's just more of my usual education angst. It just seems like if this were a campaign the slogan would be "Backwards!" Update 11-4-12: Pam Moran leaves a comment that is waaaaay better than this post is. Who decides what we really, really need to teach? The teacher part of me says I should. The citizen part of me says the community should. Brandt - I have the exact same struggle, but I'd add a third one - the student should decide what they learn. I know, but "should" vs. "will" is what is essentially the struggle? When we write objectives we say "The student will". If school's primary objective is to create citizens I wonder which would be more important (should or will). I'm also not sure how the student idea transform to other learning organizations. Do i want my doctor to decide what she wants to learn in medical school and create her own path? Do i want my soldier to create their own learning journey at basic training? But that's where I struggle, what is the "primary goal" of school? I know "creating citizens" is what many folks say, but I still feel that ultimately it should be focused on the students. I do want my doctor to create their own path to a certain extent. I certainly want them to create their path on the way to becoming a doctor. Interesting ideas to ruminate on. I think ideally the student, teacher, and community should all decide what the students learn. (idealistic i know...) To a certain extent I do think this happens. Of course we have our standards, but the teacher has choice in how they are presented. Beyond that teachers can offer students more choice through stations within the classroom and choice activities and research projects. As far as choosing your path, a student's educational path is only fixed to a certain degree. Joan - I think that's a good analogy, the "sheer weight" is holding us back. I often refer to it as "muscle memory." We all went to school, and we all have an idea of what that was like, so we both unconsciously and consciously want it to be the same. Educators have always sought the "magic bullet". In the UK, the state schools have been subject to endless reform, politically motivated, for decades. Independent education has largely reinforced establishment ideology. It is a cycle that is hard to break, presenting questions, as you have posed above, about the purpose of education that prove difficult to answer coherently. Unless (as the Lorax might have implied...) education finds a third way between the input of the skilled practitioner and the desires of the student, enabled to chart their own learning journey. Knowledge is important - and there is a growing debate over here about the merits of ED Hirsch's approach - but so to are the behaviours that will enable our young people to collaborate and be productive members of society. For me "how" we teach is the most important question we can ask ourselves. Arapahoe High School, like most, is scheduled from August(ish) through May(ish). Most schools continue this schedule. Most continue even though it is likely that nearly everyone could agree that it is counterproductive to a continuum of learning. In essence, one of the simplest problems, with high degrees of agreement amongst nearly everyone who has a stake in school, is largely unchanged. (And yes, I know that some schools have changed the schedule significantly, but bear with me - most have not). When one connects the dots as to why, it becomes easier to transfer those thoughts to nearly every other, "Why aren't schools different?" question. I am still processing the whole of your post ... wondering about it through a lens of working to understand a model for "S-curve" learning that's been a point of conversation and questioning among principals and lead coaches of late here. How do our inputs of resources either lead to advancing learning- or not? How do our decisions, either mindfully or mindlessly, impact a curve of learning by creating either inflection points of exponential growth along the curve or points where potential growth is inhibited/moderated? What changes within our solution-finding processes if we approach learning as a grand challenge vs a problem to be fixed? And, how is potential of S-curve learning growth different for an individual vs. an organization? The genius of invention/discovery can be serendipitous, but the application of such genius is often rejected within the culture to sustain status quo. Perhaps, our advanced cognitive/emotional monkey-like response exists for both good and bad reasons. How is the story of monkeys and bananas similar to doctors and teachers as @irasocol writes about in this piece at http://bit.ly/WqFnu1 ? On the other hand, what creates a petri dish environment that eventually allows for incremental or exponential viral spread of ideas that can accelerate learning? What gets us to Tesla? Human "agar" seems to resist fast change/growth within most any cultural Petri dish. I wonder if deep change only occurs when challenges to species survival are felt intuitively and cognitively by respected catalyst thinkers within the community? What changes in cultural substrate allow disruptive innovation to emerge? I am also reminded of an article in which Larry Cuban said in 1992 about tech integration into classrooms, "reforms don't change school, school changes the reform and in doing so, little changes." We educators seen content to create our own versions of flea jar lids and banana beatings. Lastly, it was heartening to be reminded recently by a retired astronaut that even Galileo's work was finally acknowledged as a pardonable offense in 1992 by the Catholic Church. http://4thefirsttime.blogspot.com/2007/09/1992-catholic-church-apologizes-to.html So, perhaps the take away is that change mostly comes slow to us humans, but eventually we'll all recognize that the earth revolves around the sun and change our thinking. I just get frustrated that it often takes far longer than the evidence would suggest we need to take as we work to convince communities of the need to change. In the meantime, a lot of kids lose out on the possibilities and potential of different futures as a result of our resistance to climbing banana poles, jumping out of the jar, or washing hands as Pasteur recommended. I find myself asking many of the same questions about school and education as you do in this post. I am an aspiring educator at the University of South Alabama; in two years, I will become a secondary education teacher. I surely hope that our schools can change and be different. With that being said, I realize that this cannot happen overnight. For many, many years, our schooling system has been exactly the same. As you said, the slogan "Backwards!" is quite applicable; in my opinion, we are moving more so backwards than forwards. We have teachers who refuse to learn new technology and that want to only teach a certain way, regardless of whether the students are actually learning. I hope that I can approach teaching in another way that IS completely different. I want to approach it with ideas that move myself and my students forward! With such a meek looking economy, we have to instill great values and great education into our students in hopes that as they grow, they will change things, including education. Thanks for the post Mr. Fisch. I enjoyed the way you correlated everything together! As a future educator, I believe that teachers should move away from the traditional classroom approach. Personally, I did not enjoy the traditional classroom because it was boring. I had to get through this approach because it was the only way to become someone. Other students did not think the same as I did and decided to drop out. Our students need a classroom with more interaction, in where they are able to express their feeling without being judged. There should be classrooms where error is welcomed and not frowned upon. I enjoyed your post and thank you.